It is the purpose of this committee to carry the message to the alcoholic who still suffers, including many members who have special needs. We define AA’s with special needs as persons who are blind or visually challenged, deaf or hearing at low levels, chronically ill or homebound. We assist with Translation Services, specifically in Area 11, and throughout the US and the Canadian General Service Conference Areas. We address those who belong to Remote Communities, where it is difficult to carry the AA message because of language, culture, geography or life condition. Who We Are … Is What We Do! 1) We provide translation equipment, which consists of three transmitters and approximately fifty headset-receivers, servicing simultaneous French, Spanish, potentially any language translations, depending upon translator ability. Also amplification of language of the speaker, usually English, for the hearing impaired. We also facilitate simultaneous translations in American Sign Language (ASL). 2) We provide books and pamphlets in other languages. The “Big Book” (Alcoholics Anonymous) has been, as of 2016, translated into 69 languages and availability is at the Area office. The “12 and 12” (Twelve Steps and Twelve Traditions) is also available. Most all literature is produced by AA World Services and is available in 80 languages. 3) We service Homeless Shelters by delivering past issues of the Grapevine and La Viña on a periodic basis to shelters in Connecticut. Distribution is by district. Our hope is to get the message in print out there to those who may want it someday. Our hope is their hope. 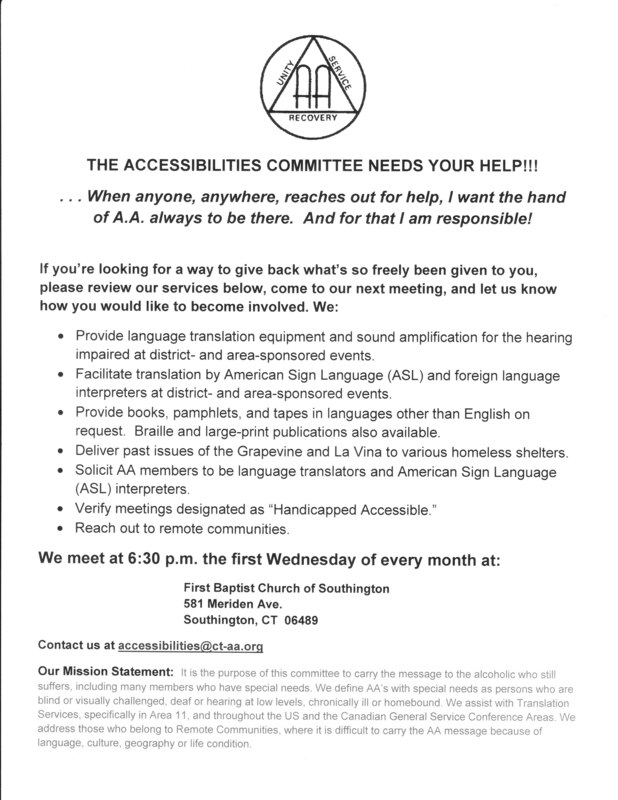 4) We gather information via two flier hand-outs: (a) do any of our AA members speak a language other than English and would they be willing to share that ability with an alcoholic in need; (b) do any of our AA meetings address a particular need that we are not aware of. As a result, we have had the response of twenty-plus Area 11 sober members who speak other languages and are willing to be contacts for those in need. 5) We gather information to determine whether meetings designated as Accessible To Handicapped and Handicapped Accessible With Facilities are actually equipped as indicated to merit those designations. This project is being addressed district by district, meeting-place by meeting-place. We want to ensure access to everyone. We have added links to these two fliers, which are to the right on the Special Needs web page. 6) We service a number of Area-sponsored events during the year that require the translation equipment, translators, etc. Some of these events are: Area Assemblies: Pre-Conference, Spring and Fall, the Roundup, Rompiendo Fronteras/Breaking Frontiers, Conventions: both AA and Al-Anon, and the CT State Conference of Young People in AA. In addition to CT Area 11, we service NERAASA, NERF and other delegate areas, such as MA, ME and RI, upon request. 7) We service District-sponsored events upon request that are considered major events. 8) In 2009, we added the Loners, Homers, and Internationalist Correspondence to our outreach to remote communities. From 2009 to his passing on December 9th, 2013, Bernie D. was the sole representative who wrote letters and mailed the Alki-Lines to AA’s who are homebound and/ or do not have meetings in their vicinity. This service has been carried on by George B. who was elected by the SNLRC committee to be the current LIM representative. Postage and Supplies for the LIM rep will be paid for by the Committee. The current LIM rep is seeking volunteers to carry the message of recovery and hope to folks who would not get it any other way. We need help locating AA’s lost in nursing homes, hospitals, and at home, who need to be found and their hope restored. The LIM portion of the Accessibilities committee continues to define itself by what it does. We invite all of you to join us. Opportunities for service are everywhere. We are in short supply of Language & ASL Interpreters, and letter writers. There are many opportunities to serve. There are many bridges to build. But we need the builders! Respectfully submitted by The Area 11 Special Needs/Languages/Remote Communities (SNLRC) Committee – April 16, 2010.